Damen is targeting the African fishing boat sector with a new ‘vessel leasing fund’, which has been set up so that budding boatowners who currently lack the money to make a down payment on a vessel can ‘gradually’ acquire a fishing vessel of their own. The idea is that the customer initially charters a Damen vessel while repaying the loan and interest, with an option to purchase the vessel outright “during the tenor of the agreement,” Damen says. Verschuren explains: “By making use of the Africa fund, customers can own a state-of-the-art Damen vessel in just a few years and tap into new business opportunities straightaway.” It is also hoped that, by making it easier for African clients to obtain quality, class-approved vessels, some progress can be made in boosting fisherman safety across the continent's coastal states. 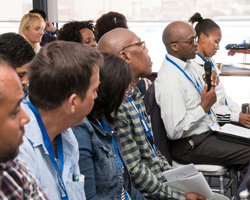 In late November 2018, Damen hosted a fishing seminar in Cape Town, South Africa (pictured, above), which was attended by 60 participants, including representatives of South Africa's five major fisheries. During the event, Benny Bhali, sales and marketing executive at Damen Shipyards Cape Town, commented: "The South African government has some important initiatives to help develop [its national fishing fleet], but it won't be able to achieve its ambitions on its own...by working in partnership with industry and government, we can provide creative solutions to move the market forward." Vessels can be built either at Damen’s Cape Town yard or at one of its other global facilities. The company reports that it has already secured Nigerian and Angolan applicants for the fund, and that, where feasible, funding for other vessel types will be considered - including fast crew suppliers, tugs and harbour-related vessels, for example.